Breedlove — Consolidated Music of Barrington, Inc.
Consolidated Music of Barrington is proud to be a dealer for Breedlove Acoustic guitars. The Premier Series offers a new take on the time tested combination of Sitka spruce and Indian rosewood. Through their Sound Profiling wood selection techniques, Breedlove offers a guitar with a more pronounced bass response that remains balanced with clear treble notes. These are truly premium guitars in sound, performance, and fit and finish. We currently have a Breedlove Premier Auditorium Copper CE in stock. The Oregon Series of guitars is as unique as the place that inspired them. These instruments use Myrtlewood, a non traditional tonewood that grows in the Northwest region of the United States. 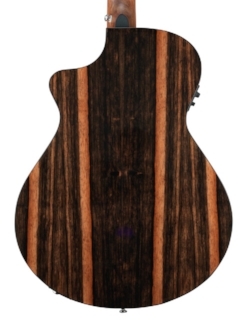 Built in Bend, Oregon, this is one Breedlove's best selling and most unique guitars. They feature Sitka/Myrtlewood and full Myrtlewood Construction. We currently have an Oregon Concerto E in stock. The USA series was created with the idea in mind that lighter weight materials result in better resonance. 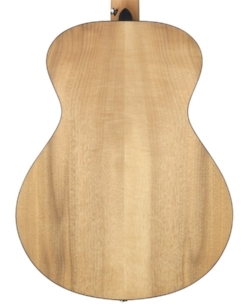 Breedlove was able to achieve this with lighter, thinner tops with some of the thinnest finishes they have ever used. Decorations are minimized for a classy, conservative aesthetic while also further reducing weight. We currently have a USA Concert Moon Light in stock. The Stage Series brings together designs created for Breedlove's U.S.A guitars, all solid wood construction, and top notch LR Baggs electronics in an instrument designed for the performing musician. These guitars are designed and quality controlled in Bend, Oregon and built in China. The Stage Exotic Series carries over many of the features of the Stage series with the addition of stunning exotic wood back and sides. We currently have a Breedlove Stage Concert CE with Sitka Spruce top and Rosewood back and sides. Includes Deluxe Breedlove Gigbag. The Pursuit Series captures Breedlove's Distinctively Crafted Sound in a more affordable package. Available in traditional wood combinations like cedar and mahogany, sitka spruce and mahogany and all mahogany construction. All Pursuit Series guitars feature Fishman electronics with a recording friendly USB out and Solid wood tops. Available in concert, dreadnought, and parlor shapes as well as a 12 string model and acoustic bass. The Pursuit Exotic Series is a collection of eight concert size guitars featuring extraordinary exotic wood backs and sides. These beautiful woods are rarely seen on guitars at this price point, making the Pursuit Exotic Series an amazing value in both sound and playable and visual impact. All other features remain consistent with the Pursuit series. We have several Pursuit Series guitars in stock now! The Discovery Series was designed with the beginning player in mind. Here at Consolidated Music, we are always on the lookout for the best entry level instrument to meet the needs of our large student population. The Discovery Series carries over Breedlove's distinctive designs and features. In addition to this, the guitars have beginner friendly features like narrower nut widths, thinner neck profiles, and radiused fretboards. All Discovery series guitars have solid sitka spruce tops and are available in the Discovery CE configuration with Fishman electronics.